Whew, sorry If I haven't been updating my blog often these past couple of weeks. Been so busy with my regular job and my freelance work. This is part 4 of my Smokey Eye series and this time its the easiest smokey eye I've ever done. Here goes. 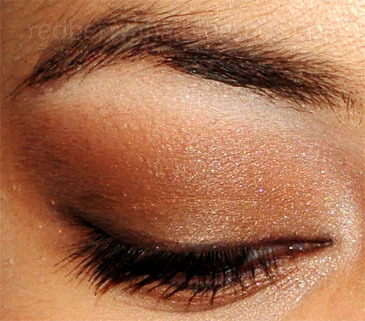 I used all brown shades on my eye including the upper and lower lash line eyeliner. I used 3 shades of brown for the eye makeup and a little bit of shimmery white on the inner corner. I used a matte white eyeshadow on my brow bone area. I just mixed two shades of lipstick to get my desired lip color. This would make a good day time makeup look. You can wear this to work too, if you're comfortable with it. haaayyy, anything brown is just lovely right sis! ang polished ng look mo , i like. Hey pretty girly! :) Your eyes look amazing. I love how you blend! Love you FOTD talaga... you look like a bumbay! Super pretty Hollie! I love it. So natural :) I'm glad you're doing more fotds! hi hot momma! you look so pretty ever! !